KidZee has lead a defining change in the pre-school category. It has undergone a rebranding exercise and introduced a unique philosophy of 'Illume'. KidzZee recently underwent a re-branding initiative with a unique philosophy of 'Illume'. With this Kidzee aims to achieve a turn over of Rs 440 million by 2011 and open 1000 preschools across India. It will also lead innovation, and bring technology by launching e-KidZee. KidZee is the largest chain of preschools in Asia with over 600 centers. In a press conference held in Mumbai KidZee announced its new brand identity along with its very own revolutionary philosophy 'Illume'. KidZee rebranded and re-positioned itself to lead innovation, bring new practices and introduce technology into the pre- school category. KidZee instituted a focused research to develop an approach suited to each child's unique learning style. Hence began this journey with a refreshed identity. Through a research carried out across 20,000 parents, 2000 teachers and 1, 00,000 children, spread over years, KidZee has given birth to 'Illume'. Illume is different from the one size fits all approach in most of the preschools, lays before a child diverse pathways: visual, auditory, interpersonal, kinaesthetic and intrapersonal. With keen observation, a note is made of the mode of learning that most interests a child. Once this is concluded, activities are built around his/her preferred learning mode. This procedure ensures that no pressure is enforced on the child and hence they grow at their own pace. The child learns how to think rather than what to think. Zee Learn CEO Sumeet Mehta said, ILLUME originated out of the need to recognise and nurture each child's unique learning needs. It is a revolutionary pedagogy, which acknowledges that, each child has unique potential and hence deserves the opportunity to discover his/her innate abilities. Present on the occasion Tisca Chopra (Television and Film Actress) said, Children being the greatest asset of the nation should be nurtured in the correct manner. No two children are same; each of them is a unique individual. Illume by KidZee addresses this need. It's commendable to see, Kidzee, the largest chain of pre-schools in Asia, take this crucial mantle towards nurturing the uniqueness in each child, giving each child the opportunity to be the best of his/her own self. 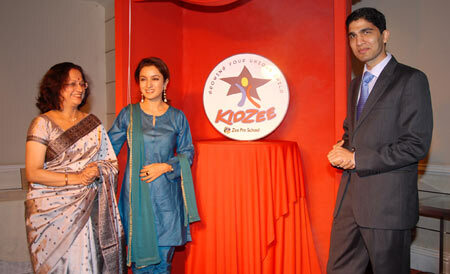 KidZee's refreshed identity included unveiling their new logo, Emblem, Uniforms, Curriculum (Illume), e-Kidzee. On the activity, Mehta commented, Being the leader in pre-schooling space, its KidZee's responsibility to lead this defining change in the category. This change begins right from our own self. The rebranding exercise would be carried out across our 623 pre-schools spread over a period of four months. Mehta further continued, We undertake this journey with the belief that it's not about how good your child is. It's about how your child is good and this very thought becomes the driving force for the Kidzee team. It gives us immense pride to have helped about two lakh parents in our journey till today; this eggs on and reminds us of the opportunity to contribute towards the most defining years of our county's future. The future prospects of KidZee are that it will also be implementing a web based solution called e-Kidzee across all its 623 pre-schools. e-kidzee is a web-based application that will give every parent a real time information on their child's development and will help them participate actively in their children's growth. KIDZEE undertakes this revolutionary approach across 262 cities in India. KidZee has been growing at a rate in excess of 35% YOY. The company aims to achieve a turn over of Rs 440 million by 2011. They will reach the mark of 1000 preschools by 2011, thereby reaching 60,000 children every year.